The Ibis people are from our home town, and have become much more well known in the last three years. The Ibis stem is unique in two regards, that the stem isn't just tubing that's cut and welded together, and among all titanium stems, this is the only one where a real attempt is made to polish out and away, the TIG welds after welding. 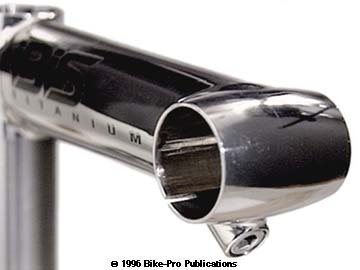 Incidentally, this stem is made from raw Titanium materials in their own facility in Northern California, not contracted out to the same Titanium materials fabricator that does much of the bike industries Titanium building. The quill section is machined from a solid piece (billet) of 6AL-4V Titanium, by Paragon Machine Works, which is considerably stronger (harder) than the Ti 3AL-2.5V alloy used to make Titanium tubing. The piece is turned on a lathe to gain its round shape and precise fit for the steerer tube. The quill is bored from the bottom to reduce the outer wall thickness to 2.5mm. The quill is also bored from the top for the expander bolt, leaving a thickness just under 5mm, that recesses and cradles the bolt head. In some stems, the recess that cradles the bolt, is a separate cap piece of dissimilar metal (aluminum), the pressure that the bolt and wedge create, may lead to the bolt cradle or quill becoming deformed. Ibis believes the one piece machined quill eliminates this potential quill, (or shaft) deformation, and therefore premature fatigue or yield. The quill is drilled with a 1/4" hole to relieve heat at the time of the extension being welded. The extension is made of Titanium tubing, that is ovalized to broaden the area of contact at each end. 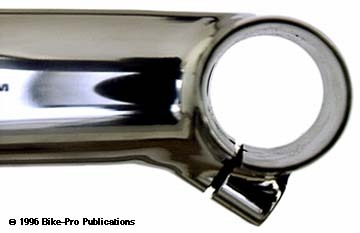 The binder tube is, once again, machined from a single piece of billet Ti 6AL-4V Titanium. The binder piece is machined so it bulges in the middle having a wall thickness of 3.18mm (.125"), where extra strength is needed, and tapers to 1.1mm thick at the ends, delivering an aesthetically pleasing shape. The binder fittings are machined Titanium rod and tapped for the binder bolt. The quill, extension, binder tube, binder fittings are TIG welded together. The welds are then sanded and actually polished and buffed smooth, which, as we mentioned is rather unique from all the other Titanium stems. A cable hanger will be needed for brake cable routing, if used without a shock fork (Ritchey, Dia Compe, or Syncros listed separately in the Brake section). The expander bolt is 127mm long, has a 6mm hex head fitting, with a 8mm by 1.25mm thread pitch and weighs 30 grams. The aluminum wedge piece, (made by Hsin Lung) is extruded, with machine work to cut, drill and tap the threads. The binder bolt is made of stainless steel, because of the tendency of Titanium surfaces, under stress, to "seize". The binder bolt has a 5mm allen head, with 6mm by 1mm thread pitch, and is 20mm long, weighing 6 grams. The Ibis Mountain stem comes in two rises, a low 0 degree or a +10 degree rise, both are available in 120mm, 135mm, or 150mm lengths, to fit 25.4mm diameter handlebars. The Ibis Mountain stem is made only in 1" or 1 1/8" diameters. The Ibis MTB stem in 1" diameter, a120mm length and a 10 degree rise weighs 215.5 grams. While Ibis has a great name for themselves with their handcrafted, high polished Ti stem, they are making the same stem available without all the sanding and hand polishing. The stem itself would remain unchanged, just its exterior finish. What they intend to do is to sand blast the exterior of the stem with glass beads. This would leave the outer surface of the Ibis with the light-texured Grey appearance of the Litespeed Satin finished stems. Because this Satin finished stem is far less labor intensive, we can sell this Ibis stem for just $209.99. Ibis also makes a road racing version of their mountain bike stem, and every technique used in making MTB stem is used identically here. The same quill, extension, binder tube, and bolt arrangement. It has the same welds, and finish work. The Ibis Road stem is made with a minus 17 degree rise in 100mm, 110mm, 120mm, 130mm, or 140mm length. It is also made in a 0 degree rise in 90mm, 100mm, 110mm, 120mm, or 130mm. The inner diameter of the binder tube is 26.0mm to fit the present road handle bar standard. The Ibis Road stem in 120mm length with a -17 degree rise, weighs 210 grams. 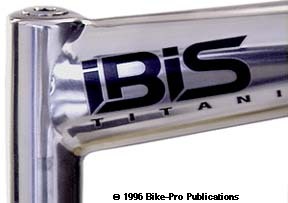 Because Ibis actually does every step in the making of their Titanium stems in their own facility, it is possible to prevail on them to make a custom stem, that is unique and individual. In the case of a custom stem, they can be 1", 1 1/8" or 1 1/4" diameter, you aren't limited to the 1" or the 1 1/8" size of their production stems. You are also permited to choose any practical extension length, and you can decide on the angle of the extension, minus or positive. It will take about three weeks to make and then about a week for shipping and delivery, so patience is also a requirement in ordering. The Ibis mountain stem is also available in an Ahead, clamp-on style for use with threadless forks. The same binder and extension assembly are welded to a 1.6" tall vertical clampinf tube. The clamping tube has a binder fitting machined from Ti rod for the clamping bolt welded in the center at the rear. With the fitting in place the vertical tube is sawn through to craete the clamping mechanism. The same stainless steel bolt used in the binder, is also used for the clamp. The Ahead model comes the same sizes, lengths and angles as the Mountain model. A 120mm long Ahead, with a 1" diameter and a 0 degree rise weighs 134.5 grams.